Stock photo of Horseshoe Falls at dusk on he Niagara River at Niagara Falls in Ontario, Canada. Stock Photos from the collection "Niagara Falls Stock Photos"
This stock photo looks directly at Horseshoe Falls at dusk, a tall wide waterfall which is on the Canadian side of the Niagara River at dusk, Niagara Falls, Ontario, Canada. Large rocks, swirling water, and air filled with mist make up the foreground view as seen from across the falls. A small piece of land juts out into the river above the tall white sheets of the waterfall, next to which you can see the rapids rolling toward the falls under a strip of blue sky. 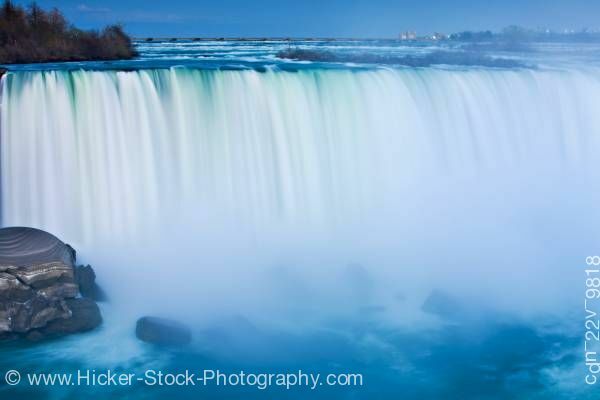 Related pictures with keyword "Niagara Falls stock photos"